Trial By Sapphire: I'm in Three Places at Once! Yes, it's true! I'm in three places today! If you're new to Trial By Sapphire, welcome! Please make yourself at home and take a look around. You can find me over at my friend Lisa's blog, Momma's Me Time, sharing the importance of My "Me" Time. 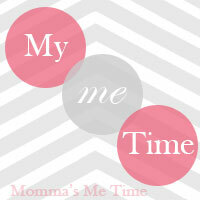 The need for "me" time isn't limited to parents. We all need it! I'm also sharing my bride advice as part of Holly's Wedding Week series at Eight Six Eleven while she is on her honeymoon. My first anniversary is on Monday! As a bride, I was given some very good advice in that final week of planning, and I learned some things too. I hope my advice is helpful to someone out there! Please stop by Lisa and Holly's blogs to read my posts and say hi! And of course, I hope you'll be joining Emily and I for Flaunt Your Cause next week! Cheers to the weekend! Enjoy it! My bbff is super human :) Now I have to go to all three places, one at a time, to see you. Hehe. Only you could pull of the 3 places in once thing! LOVEEEEE that wedding post. When I (finally) get engaged you're coming to FL and planning my wedding. Deal?! Just found your blog! So cute. Loved reading your wedding week post!